Strong wheat yields across the U.S. are proving to be burdensome on wheat markets already struggling to deal with large U.S and global inventories. In many areas producers are facing the lowest cash prices they have seen in years. These weak prices have left wheat production in the U.S. with a bleak economic outlook. In many areas of the Great Plains cash bids are hovering near, and have sometimes below, the $3.00 per bushel barrier. (Here are some – rather depressing – Kansas and Nebraska bids). It has gotten so bad that in some areas of the country cash wheat prices have reached levels that trigger the ability to collect payments from the USDA’s Loan Deficiency Program (LDP) (something few people seriously contemplated when the last farm bill was written). The situation in the wheat market is symptomatic of many of the issues facing grain producers and we believe that it likely has many broader implications for the entire grain sector. So over the next few months we are going to feature several posts evaluating the situation in wheat production. Internally we’ve been describing it as our “wheat’s woes” analysis. This week’s posts takes a look at trends in U.S. wheat acres. 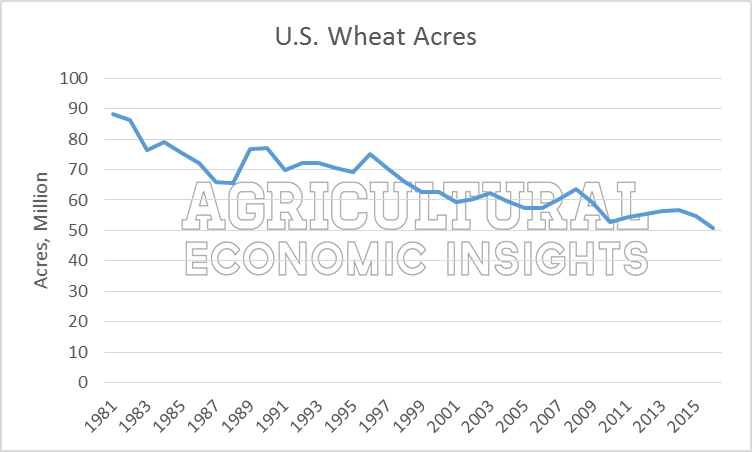 While wheat prices have taken a sour-turn recently, wheat acres have been in a downward trend for decades. Over the past 35 years (1981 to 2016) wheat acres have contracted from more than 88 million acres to fewer than 51 million acres (Figure 1), a decline of more than 27 million acres. While the decline is quite large, it’s important to consider the rates of decline. Over the 35 years, a trend-line through the data reveals that wheat acres contracted at a rate of 816,000 acres per year (not shown). For context, this rate is nearly equal to losing a Kansas-worth of wheat acres every decade (Kansas planted 8.5 million acres of wheat in 2016). While 816,000 fewer acres each year seems very large, it’s important to keep that in perspective. The decline in acres is also equal to an annualized rate of change of -1.6%. While a 1.6% annual decline is small, small changes over a long period of time become very large. Especially when sustained over 35 years. Figure 1. U.S. Wheat Acres, 1981- 2016. Data Source: USDA NASS. Looking back further in the data it’s easy to see that U.S. wheat is no stranger to drastic changes in acres (figure 2). 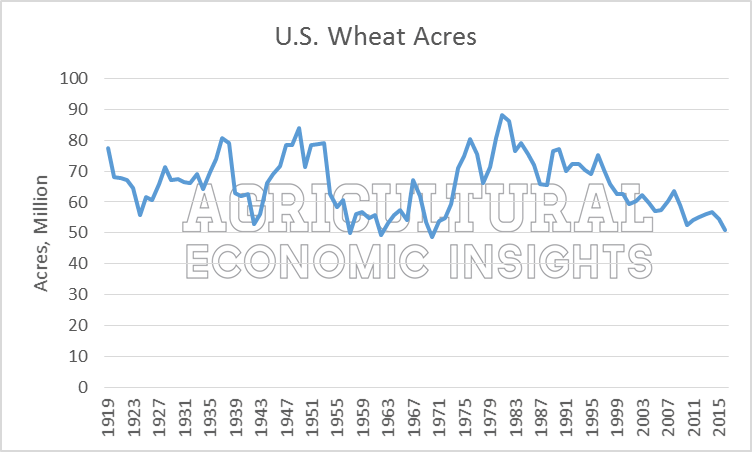 Over the past 97 years, wheat acres have experienced several periods of large increases and decreases. Prior to the record-high sowings of 1981 (88.3 million acres), wheat acres hit their lowest levels in 1970 at 48.7 million acres. A key element of the previous farm economic boom (the 1970s) was strong wheat exports fueling a rapid expansion of U.S. wheat acres. Wheat acres also contracted sharply during World War II (80.8 million acres in 1937 to 53.0 million in 1942) to later surge again by 1953 (78.9 million). In short, wheat has been susceptible to wild swings in acres. Most of the changes happened in short periods of time. The major difference with the current period of acreage decline is that the downward trend has been the relatively slower, spanning multiple decades. Figure 2. U.S. Wheat Acres, 1919- 2016. Data Source: USDA NASS. Acres of U.S. wheat have steadily declined over the last 35 years. This trend lower has been the result of small but consistent declines over several years. Looking over nearly 100 years of data, it’s clear that wheat is no stranger to large changes in planted acres . If anything, the pace of change occurring since 1981 has been slow relative to previous changes. As we will cover in upcoming posts, attention will be on wheat acres planted in the upcoming Fall and Spring. The markets will closely monitor this as transitions away from wheat will likely result in addition acres of corn and sorghum. Stay tuned.